I generally like my books to be well-maintained. Although I don’t go through the trouble of wrapping them in plastic (I choose to just be careful with how I use them), this particular book is a little dog eared from my constant flipping and bookmarking. 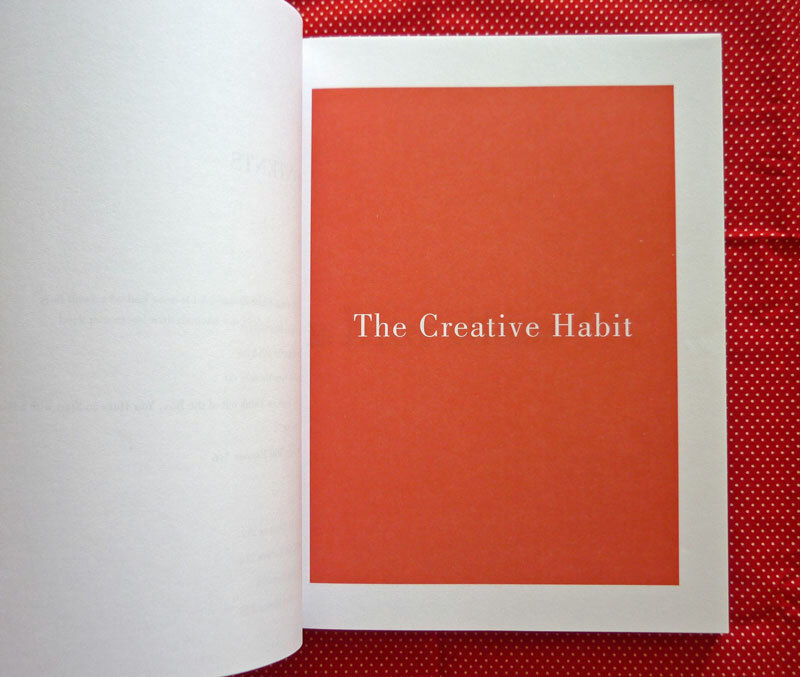 I wrote that The Creative Habit is one of my must haves in part one of my Etsy Virtual Labs recap and I’ll tell you why. First, a little background. Twyla Tharp is a choreographer who has created 130 dances for her company and many others like Joffrey Ballet and London’s Royal Ballet. 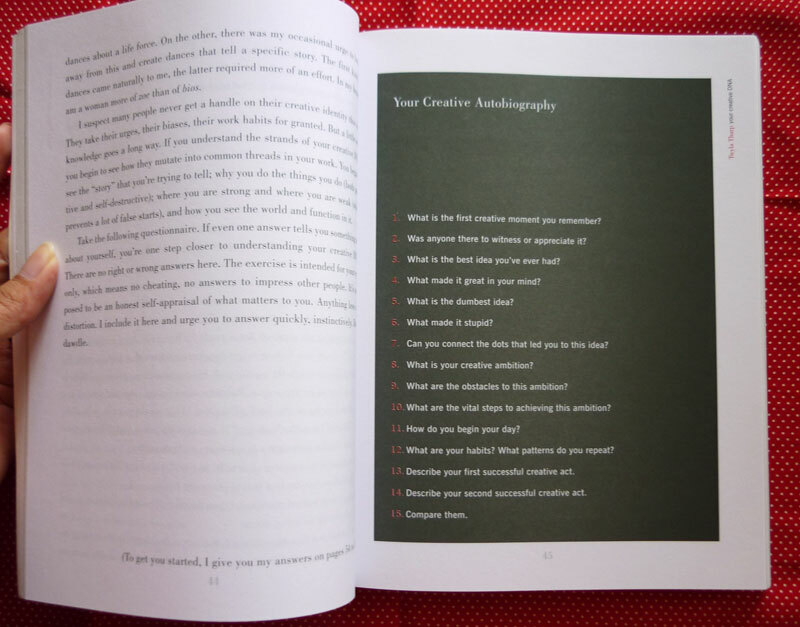 What shines throughout this book, is how Twyla talks about creativity in the way she knows. Although choreography is a different way of expressing one’s ideas through art, the formula to achieve creativity in all levels of your life is a common thread that binds all creative types together. 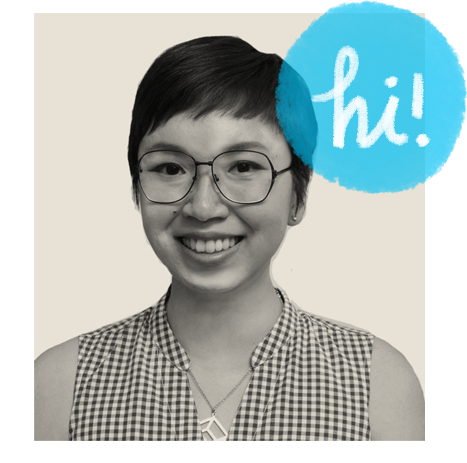 Drawing, writing, performing, singing and even business — she doesn’t discriminate what field you’re in. Rather, she offers learning through her eyes and opens up the reader’s mind via her experiences. A choreographer starts with an empty room. Artists start with a blank canvas. 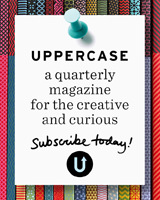 She’s like a mentor who guides you through the moments of despair (how do I make my first mark on that virginal slate?) to organizing your thoughts and how to take everything in without losing a part of yourself in the process. 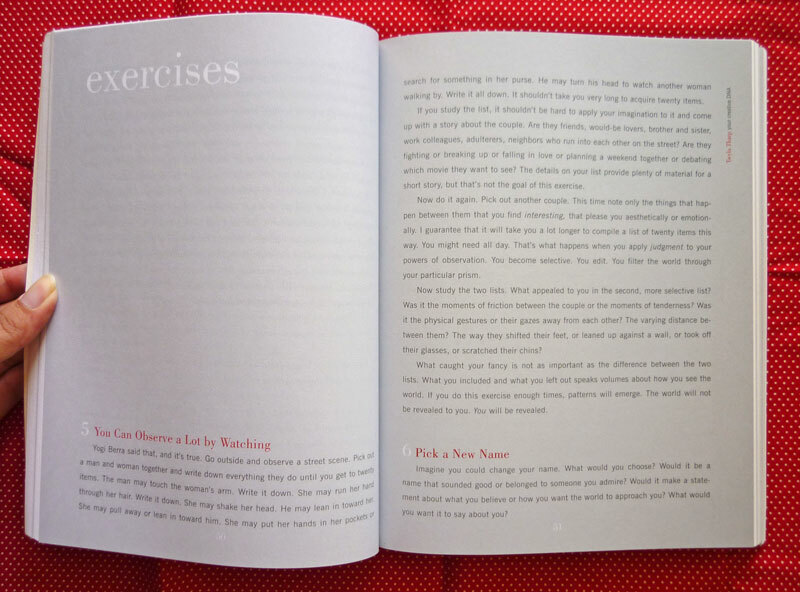 What first attracted me to the book was that each topic had exercises for you to do. The questions are the kind that make you think and reflect; and to also put the wheels in motion for whatever it is you’re planning. 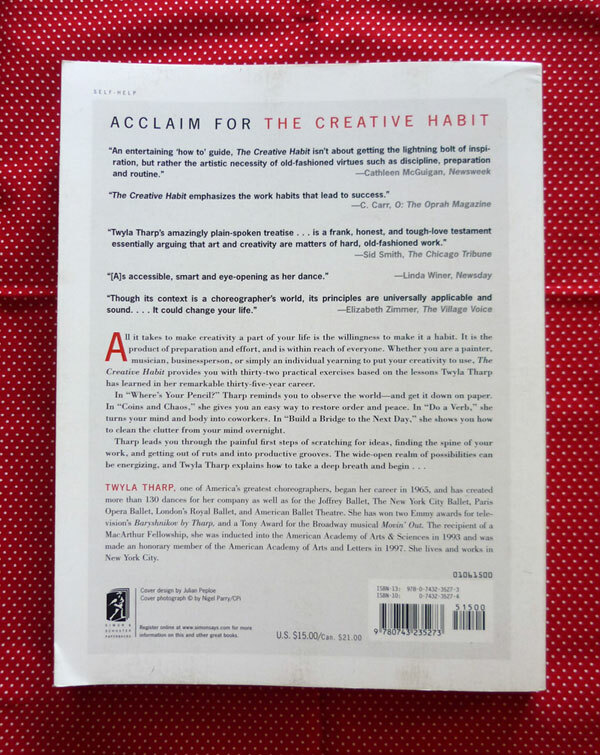 It has sound advice on how to make positive habit and rituals a part of your routine, and clearly states that there is no shortcut to success – in arts or in business. I personally believe that the more hardworking you are, the luckier you get – because you’ll be more open to opportunities and would be able to recognize them. I love how this book stresses on building yourself up through constantly challenging your ideas, and to conquer the fear of creating. One of the most important message that she imparts, is that flexibility is a trait that comes in handy when you’re creating – no matter what the product is. 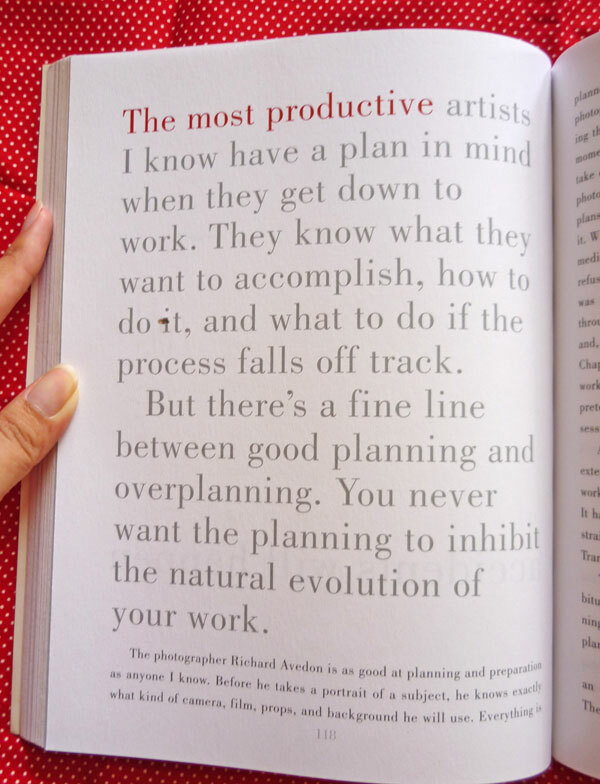 Part of being creative is the ability to recognize the changes that happen throughout the course of creating, and to embrace new directions instead of stubbornly sticking to a plan that does not work anymore. After all, everything is a work in progress. So why not stop, take a breather and reassess things before going further? Looking at things with new eyes is a skill that’s worth getting to know better. 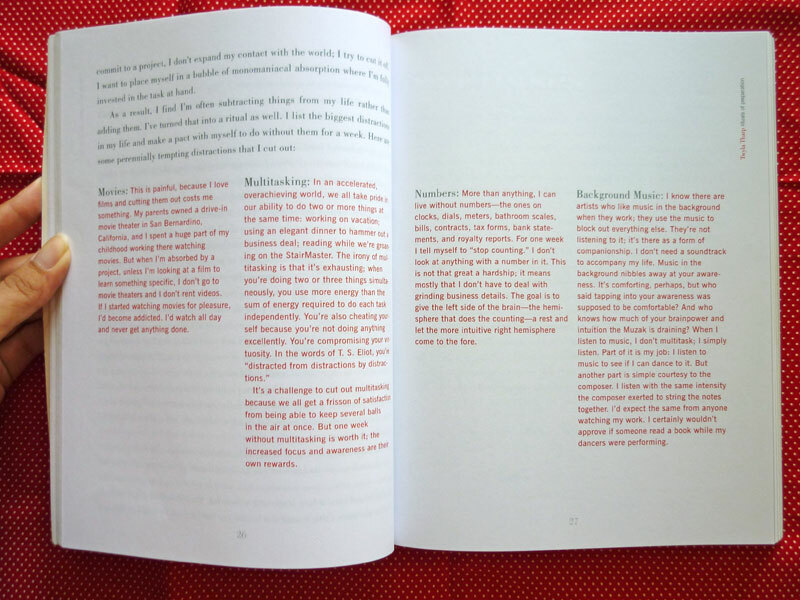 The layout of the book is refreshing – with only three colors used throughout the book, the beauty of it lies in the simplicity of its design. It’s visually arresting, and easily accessible – beautiful fonts, hierarchy of text and easy-on-the-eyes line height makes it stand out even more. I wish more books were like this! 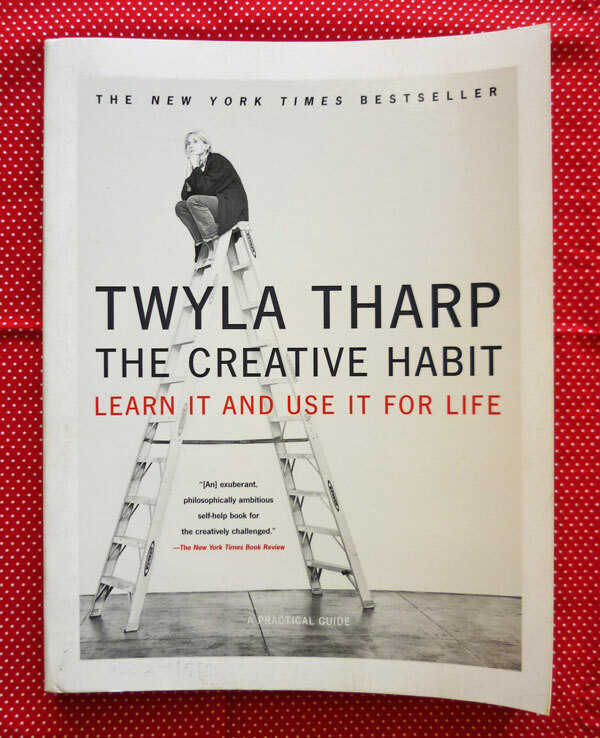 As one who believes in hard work and good habits, I am drawn to Twyla’s no-nonsense approach to creative exploration. I believe that with perseverance and by putting my nose to the grindstone, I’ll be able to achieve anything that I want, slowly but surely*. This isn’t a spiritual guide – I consider The Creative Habit to be a kick in the pants, albeit a gentle one to get you going. Anyone who is stuck, or for those who need help in learning to think out of the box. Who wouldn’t want to pick this up? Those who believe that luck is not about hard work and that it’s all flukes, and those who aren’t willing to put in the work to be great. *Note: I know that I won’t be able to get everything I want, no matter how hard I try. I just want to do it, and at least give it a good go before I concede defeat – because I have an allergy of listening to advice from those who have never done the work, but laments that it is hard. I know, I’m stubborn that way! With that thought, I’ll leave you to ponder a little and bid you a happy weekend! LOVED this book. There is another one out call The Collaborative Habit: Life Lessons for Working Together. It’s also just as amazing as this one. Thanks for the review, I hadn’t hear of this book but have ordered as it sounds amazing and just what I need. Ah yes! Thanks Megan — I have her new book on my wishlist for the longest time! I should get a copy soon. And Carina, exactly my sentiments! hi amy, thanks for this in-depth review! i’m going to purchase it within the next few days . i can’t wait to read this book! i really enjoy your book reviews! this book sounds like just what i need. thank you for the tip! Greetings! We are offering service of resume writing to everyone who needs guidelines in resumes. If you are interested just click the link for more information and details. Creative habit gives us muchinformation about various kinds of materials. Judging from the review, this book is fantastic! I wonder where can I get it. I haven’t seen it in bookstores in my town.